The Dyson DC34 hand-held vacuum is often regarded as the most efficient small vacuum cleaning system available. The manufacturer, Dyson, is very well respected in the industry for having redesigned a standard electric motor to create a digital motor that performs with much greater speed and efficiency than other vacuum motors. 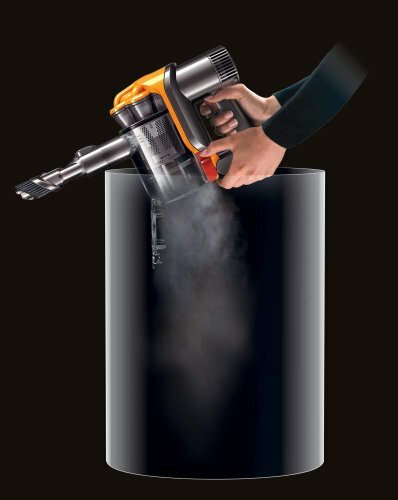 The result is a small vacuum that can handle the toughest vacuuming chores that you have. According to Dyson, one of the drivers in their 10 year quest to redesign the standard electric motor was that it had been almost 100 years since someone substantially improved upon the original design. They therefore started from the ground up and created a motor that actually revolves 5 times faster than a sports car. Because the motor is so efficient, it means that a bag is no longer necessary. The motor can create suction that will pull even the most stubborn of dirt pieces directly into a storage container. 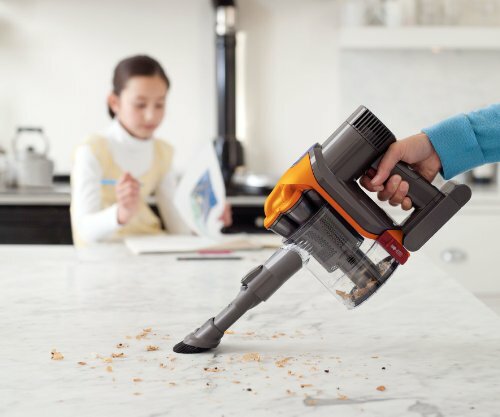 Battery operated, the Dyson DC34 hand-held vacuum operates quietly and can maintain a charge for 10 minutes in normal mode, while lasting for 6 minutes when it is being used in Max mode, a mode where the vacuum will perform as effectively as much larger machines. Alongside the Dyson digital motor, that comes standard with every machine, there are a variety of other features such as: two-mode operation, fast charging, no-mess waste transfer, and a variety of attachments to reach every place in your home or vehicle worthy of being vacuumed. The Dyson DC34 handheld vacuum has dimensions of 4.4 x 12.7 x 8.1 inches and weighs between 1 and 2 pounds, making it easy for anyone to use when they are cleaning up. As far as power generation goes, it ships with a 22.2 volt lithium ion battery which is a solid choice inasmuch as it is capable of creating a very stable power source. The adapter can work between the range of 100 and 240 volts, making it possible to use with either home or portable power sources. The vacuum ships with a wide angle and brush attachment as well as a narrow channel attachment that it perfect for vacuuming corners and hard to reach places. Dyson realized that if they could generate enough speed with their motor, they could bypass the need for a vacuum bag. The logic was simple. If the motor could create enough suction that created a force many times the force of gravity, it would pull particles and dirt directly into a bin that is visible to the user and therefore can be changed when the owner sees that it is full. The motor therefore operates at close to 100,000 times the pull of gravity because it spins so fast. And if you are pleased with the regular performance, there is a button on the side that changes to Max mode when it is pressed, allowing the vacuum motor to operate at full capacity for tough jobs. The waste bin has a plastic see-through container attached that can be easily popped off the vacuum and emptied when necessary. Overall, although using the Dyson DC34 on a large surface area such as an RV takes a little bit of planning because you will likely need to recharge the batteries a couple of times, it is an ideal tool to keep on tap for your outings or for cleaning room-specific messes in your home. The strength of the motor allows for superior performance that should keep any kitchen, dining area, or family room free of dirt year-round.